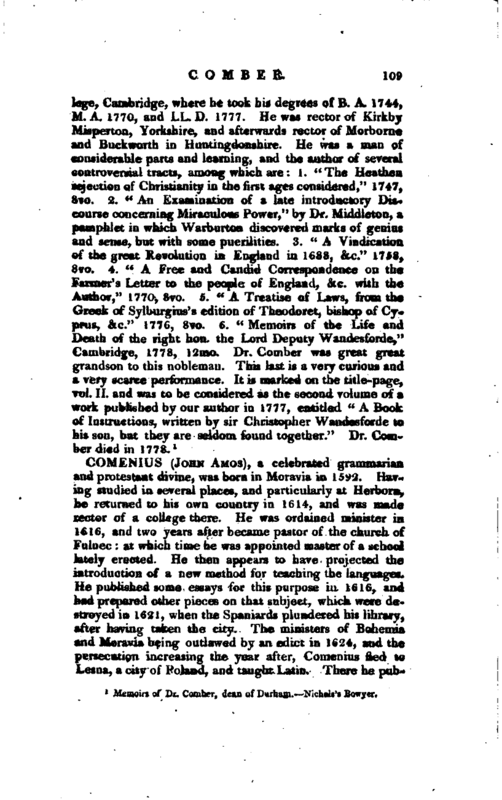 , a celebrated grammarian and protestant divine, was born in Moravia in 1592. Having studied in several places, and particularly at Herborn, he returned to his own country in 1614, and was made rector of a college there. He was ordained minister in 1616, and two years after became pastor of the church of Fulnec: at which time he was appointed master of a school lately erected. 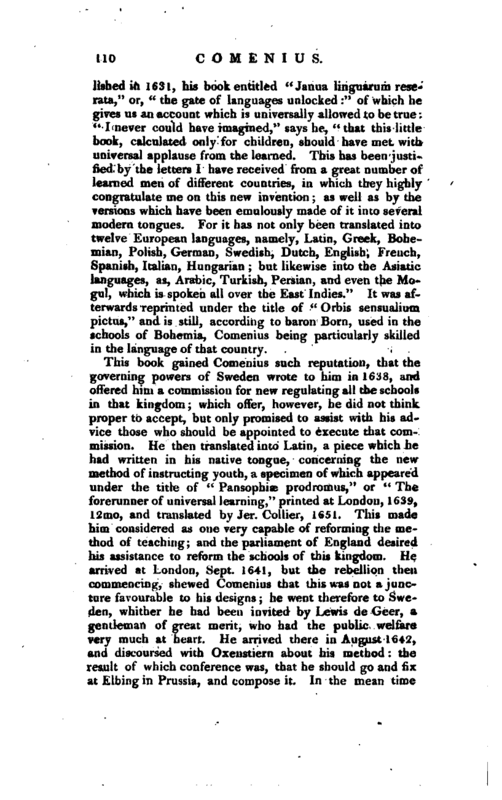 He then appears to have projected the introduction of a new method for teaching the languages. He published some essays for this purpose in 1616, and had prepared other pieces on that subject, which were destroyed in 1621, when the Spaniards plundered his library, after having taken the city. The ministers of Bohemia, and Moravia being outlawed by an edict in 1624, and the persecution increasing the year after, Comenius fled to Lesna, a city of Poland, and taught Latin. There he | published in 1631, his book entitled “Janua linguarum reserata,” or, “the gate of languages unlocked” of which he gives us an account which is universally allowed to be true “I never could have imagined,” says he, “that this little book, calculated only for children, should have met with universal applause from the learned. This has been justified by the letters I have received from a great number of learned men of different countries, in which they highly congratulate me on this new invention; as well as by the versions which have been emulously made of it into several modern tongues. For it has not only been translated into twelve European languages, namely, Latin, Greek, Bohemian, Polish, German, Swedish, Dutch, English, French, Spanish, Italian, Hungarian; but likewise into the Asiatic languages, as, Arabic, Turkish, Persian, and even the Mogul, which is spoken all over the East Indies.” It was afterwards reprinted under the title of “Orbis sensualium pictus,” and is still, according to baron Born, used in the schools of Bohemia, Comenius being particularly skilled in the language of that country. 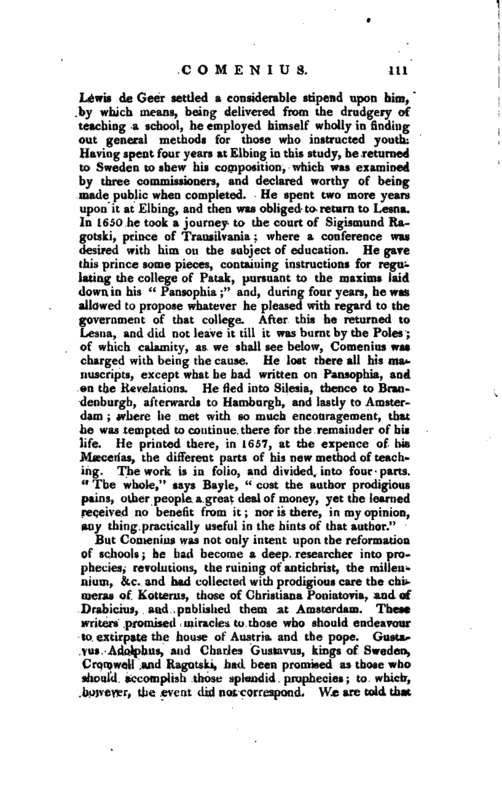 But Comenius was not only intent upon the reformation of schools; he had become a deep re’searcher into prophecies, revolutions, the ruining of antichrist, the millennium, &c. and had collected with prodigious care the chimeras of Kotterus, those of Christiana Poniatovia, and of Drabicius, and published them at Amsterdam. These writers promised miracles to those who stiould endeavour to extirpate the house of Austria and the pope. Gustavus Adolphus, and Charles Gustavus, kings of Sweden, Cromwell and Ragotski, had been promised as those who should accomplish those splendid prophecies; to which, however, the event did not correspond. 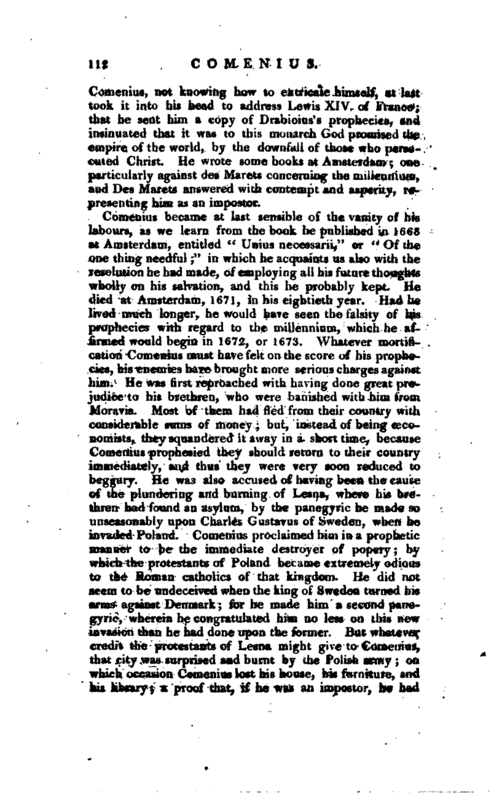 We are told that | Comenius, not knowing how to extricate himself, at last took it into his head to address Lewis XIV, of France; that he sent him a copy of Drabicius’s prophecies, and insinuated that it was to this monarch God promised the empire of the world, by the downfall of those who persecuted Christ. He wrote some books at Amsterdam; one particularly against des Marets concerning the millennium, and Des Marets answered with contempt and asperity, representing him as an impostor. Comenius became at last sensible of the vanity of his labours, as we learn from the book he published in 1668 at Amsterdam, entitled “Unius necessarii,” or “Of the one thing needful;” in which he acquaints us also with the resolution he had made, of employing all his future thoughts wholly on his salvation, and this he probably kept. He died at Amsterdam, 1671, in his eightieth year. Had he lived much longer, he would have seen the falsity of his prophecies with regard to the millennium, which he affirmed would begin in 1672, or 1673. Whatever mortification Comenius must have felt on the score of his prophecies, his enemies have brought more serious charges against him. He was first reproached with having done great prejudice to his brethren, who were banished with him from Moravia. Most of them had fled from their country with considerable sums of money; but, instead of being ceconomists, they squandered it away in a short time, because Comenius prophesied they should return to their country immediately, and thus they were very soon reduced to beggary. He was also accused of having been the cause of the plundering and burning of Lesna, where his brethren had found an asylum, by the panegyric he made so unseasonably upon Charles Gustavus of Sweden, when he invaded Poland. Comenius proclaimed him in a prophetic manner to be the immediate destroyer of popery; by which the protestants of Poland became extremely odious to the Roman catholics of that kingdom. He did not seem to be undeceived when the king of Sweden turned his arms against Denmark; for he made him a second panegyric, wherein he congratulated him no less on this new invasion than he had done upon the former. But whatever credit the protestants of Lesna might give to Comenius, that city was surprised and burnt by the Polish army; on which occasion Comenius lost his house, his furniture, and his library; a proof that, if he was an impostor, he had | first deceived himself. Part of his apocalyptic treatises, and some other pieces relating to his Pansophia, escaped the flames; he having just time to cover them, in a hole under ground, from which they were taken ten days after the fire but his “Lexicon Bobemicum,” a work which baron Born conceives would have been of the highest utility, was totally destroyed. On this he had spent above forty years of his life. 1 Gen. Dict.—Baron Born’s Kiftgies Viroratn Bohemia?, vol. I— Morhoff l*olyhisr. who speaks with much severity of his “J,mua Linguanim.”—Foppea Bibl. Belg.—Brucker’s Hist, of Philosophy.—Freytag Adparat. 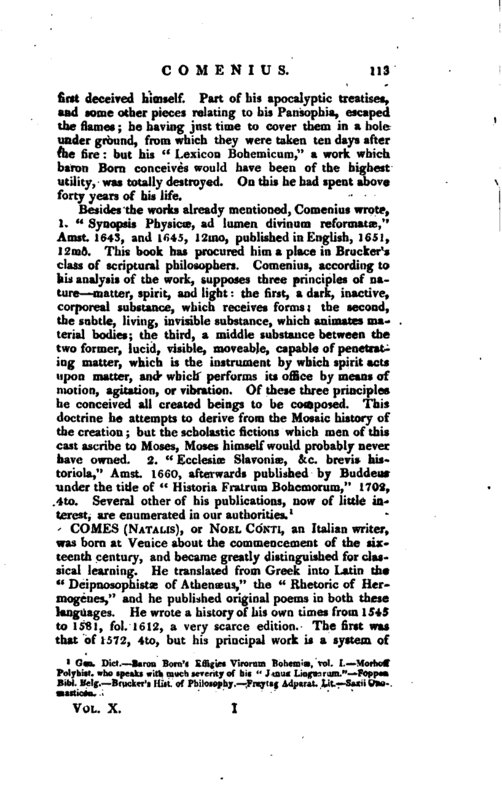 Lit.—Saxii Onomasticon.